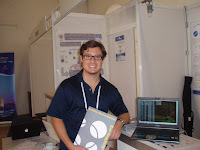 GridCast: live and behind the scenes of grid computing: What's going on at Demo Booth 11? What's going on at Demo Booth 11? Nearby the Ataturk and Barbaros Hall B (2nd. Floor) you'll find Demo Booth 11. 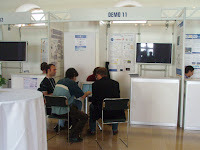 There, you'll see that Grid Computing doesn't only multiply available resources... in fact, Demo Booth 11 is a Multi-demo Booth! Theory is OK, but this is a Demo Booth, right? Actually, we have chosen 3 ported applications on production state (this is why I said Multi-demo before) and they will be shown to interested visitors. One of the demos is given by me. I'll explain you how we ported using the GridWay Metascheduler a Bioinformatics application called CD-HIT (porposed by the Spanish National Cancer Centre), wich implements a particular workflow (don't panic! I brough a poster ;-D). Then you'll actually watch it running on the EGEE infrastructure at real time! If "An image is worth one thousand words", "A Demo is worth 1 TeraByte".